What if there were a product you could add to any pool that would make it safer; destroy microorganisms, break down irritating chloramines and keep the water clearer? What if that product could install with a couple of unions and simply plug and play? And what if we could do all of this while adding zero new chemicals to the water? Are you interested? Then it’s time to get to know UV-C. Ultraviolet is a great introduction to advanced sanitizer systems. It is chemical free since the only active component is ultraviolet (UV) rays of light. Coupled with an active sanitizer like chlorine, UV systems help maintain a safe residual by sharing the sanitizer burden, thereby reducing dependence on chemicals alone. European scientists discovered the germicidal properties of sunlight on surface water over a century ago. This realization led to the invention of UV-C bulbs for their sanitizing properties and use in industrial applications. Unlike chemical disinfectants such as chlorine, UV-C light kills pathogens at the root. UV-C light interferes with the DNA and reproductive cycles of the organisms, thereby eliminating bacteria. How does it do that you ask? As water circulates through the light chamber, UV-C light passes over harmful pathogens causing permanent damage. By disrupting their DNA, all the nasty protozoans, viruses and bacteria are unable to reproduce. This happens almost instantaneously, and without changing the composition of the water. In a pool or spa UV-C system, water circulates past UV-C lamps. Flow rate is key, because contact time is critical for an effective kill rate. 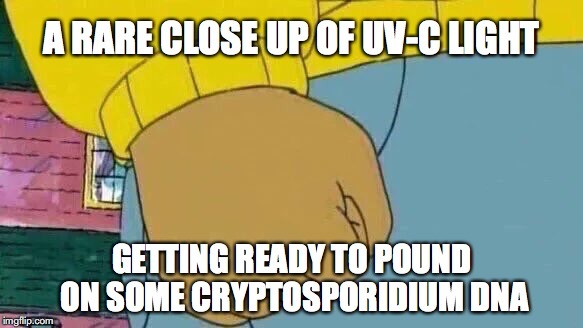 UV-C light is particularly good for inactivating Cryptosporidium (Crypto), and is highly effective when paired with an active residual sanitizer. WHAT DOES UV-C LIGHT DO TO THE WATER? UV-C light also cleans water instantly and without altering the water’s composition. Because UV shares the burden of disinfection, the pool needs less chlorine to do its portion of the work under normal conditions. Have questions about UV-C? Complete the form below to contact a CMP Sales Representative. UV / OZONE / AOP: WHAT’S THE DIFFERENCE? The three most popular secondary sanitizer systems for pools utilize UV-C, Ozone, and Advanced Oxidation Process (AOP). 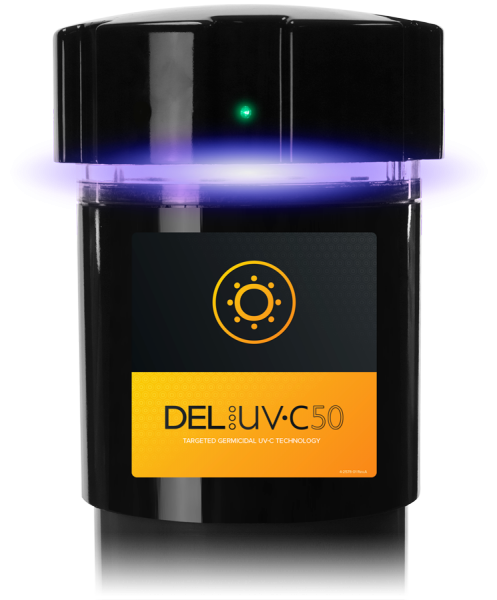 UV-C: As described above, UV-C light is a simple solution harnessed from sunlight that breaks down organism infestations at the DNA level and is totally chemical free. UV-C light cleans instantly without altering the water’s composition. Ozone: Systems that use ozone gas, a powerful oxidant made of three oxygen atoms (O3). The third oxygen atom in Ozone has a weak bond, which breaks off and destroys foreign bodies in the water. Ozone can safely kill pathogens, microorganisms and both organic and inorganic contaminants through oxidation. AOP: A double-threat combination of UV and Ozone that creates powerful hydroxyl radical oxidizers that react with dissolved waterborne contaminants in a series of strong oxidation reactions. This process happens almost instantaneously. AOP is dramatically more powerful than chlorine and other sanitizers, and even more powerful than Ozone alone. WHO SHOULD BUY UV SYSTEMS? 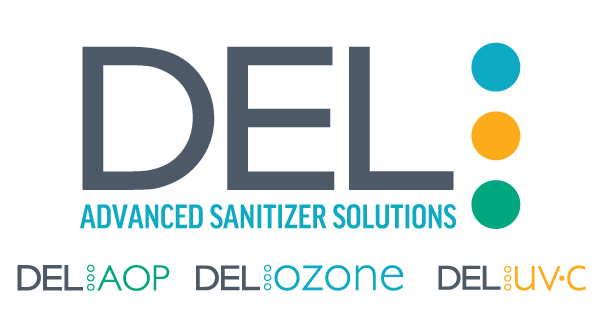 Ozone and AOP are very powerful sanitizers that use Ozone and Hydroxyl Radicals in the water. Both methods inject ozone into the water which then reacts with the water and subsequent parts of the process to develop hydroxyl radicals. With UV systems, there are no additives introduced to the pool. For customers that prefer a totally chemical, additive, reactant free sanitizer option, UV systems are the most chemical free solution. Customers that shy away from new technology will enjoy the simplicity of UV systems. Because it is easy to install and easy to explain, UV is a great introduction product for advanced sanitizer customers. UV-C water treatment can improve and enhance pool water better than a residual sanitizer alone. Natural ultraviolet light rays break down contaminants and break down chlorine-resistant organisms like Crypto at the DNA level. The UV-C 50 is the easiest way to introduce customers to safer water and advanced sanitizer systems. With a better understanding of advanced sanitizer systems and their strengths alongside chlorine and bromine, we can create better ways to keep complete modern pools and spas healthy and clean.